Specifically engineered for extended drain intervals up to 500,000 miles as set by equipment manufacturers for over-the-road trucks and heavy equipment. Provides long life in passenger cars and trucks. Protects against wear and improves equipment life. Excellent "All Season" summer and winter performance. Outperforms all conventional gear oils. Compatible with most limited-slip differentials. AMSOIL Long Life Synthetic Gear Lubes, in the correct viscosity grades, are recommended for all domestic and foreign applications such as over-the-road trucks, light, medium and heavyduty trucks, off-road equipment, commercial vehicles, motorhomes, autos, SUVs, emergency vehicles, busses, delivery/utility vehicles and tractors. 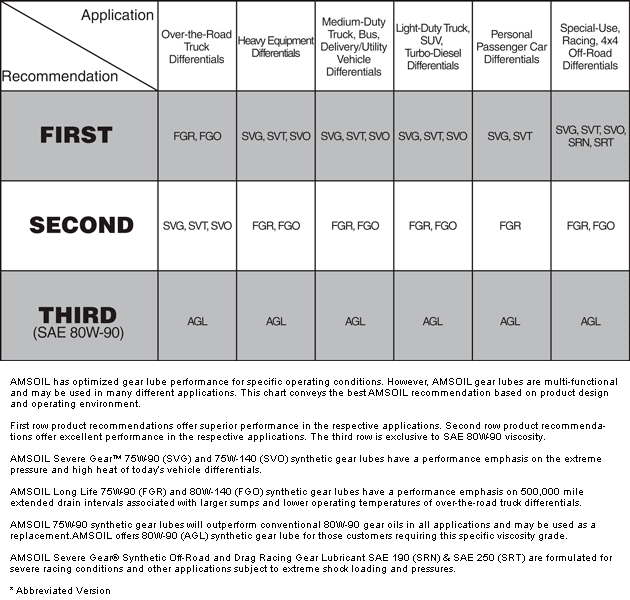 Use AMSOIL Extended Drain Synthetic Gear oils in differentials, manual transmissions or other gear applications where one or more of the following standards are specified: API GL-5 & MT-1, MIL-PRF-2105E, Dana SHAES 234 (Formerly Eaton PS-037) for 250,000 miles, Dana SHAES 256 (Formerly Eaton PS-163) for 500,000 miles, Mack GO-J & GO-J+, Meritor 0-76N (75W-90) & 0-80 (80W-140), and Navistar TMS 6816 plus hypoid gear oil specifications from all foreign and domestic manufacturers such as GM, Ford and Daimler Chrysler. Can also be used in rear axles where API Service GL-4 lubricant is recommended. AMSOIL Long Life Synthetic Gear Lubes are extended drain gear lubes engineered specifically to last several times longer and protect gears better than all conventional gear oils. 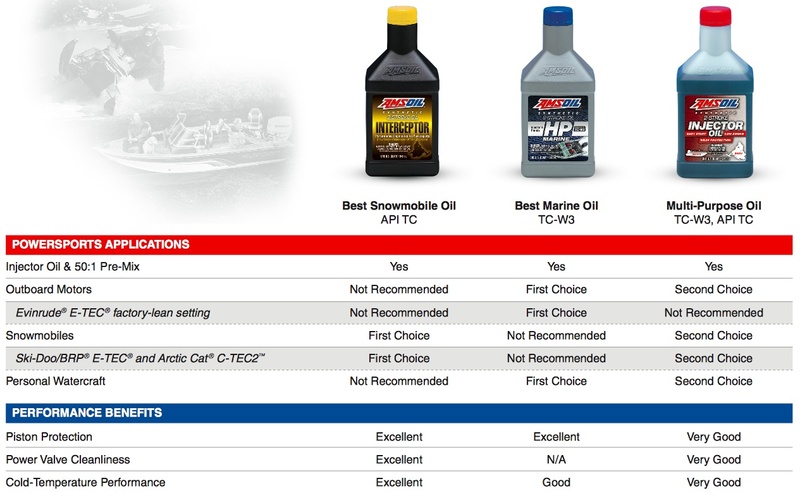 These exclusive AMSOIL formulations of premium synthetic base oils and high performance additives resist acid, carbon and varnish formation from oxidative breakdown. Components run cleaner and last longer. AMSOIL Long Life Synthetic Gear Lubes are shear stable and friction reducing. They maintain their viscosity during extended service for maximum wear control and they are fuel-efficient. The superior cold temperature fluidity and high temperature stability properties of AMSOIL Long Life Synthetic Gear Lubes make them excellent for all-season use. Equipment lasts longer and maintenance costs are reduced with AMSOIL Long Life Synthetic Gear Lubes. 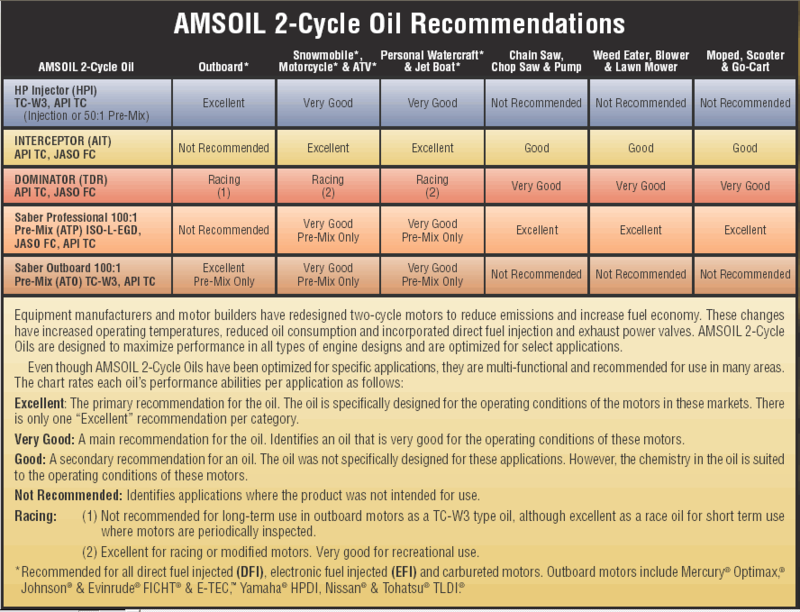 Click here to view the MSDS Data Sheet for AMSOIL FGR. For product service life in differentials, consult your owner's manual or the Original Equipment Manufacturer (OEM) to establish the application, NORMAL or SEVERE. Class 8 Line Haul Follow the OEM drain interval (miles or hours) for synthetic oil up to 500,000 miles or three years, whichever comes first. Otherwise, drain at twice the OEM interval for petroleum oil. Off-Road Vocational Follow the OEM drain interval (miles or hours) for synthetic oil up to 120,000 miles or one year, whichever comes first. Otherwise, drain at twice the OEM interval for petroleum oil. Votes & Reviews: 34 vote(s) and 20 user reviews. Used it in the rear end of My toyota tacoma seems great can't beat the price compared to severe gear lube . I replaced the OEM oil in the manual transmission on a 2014 Subaru Outback at about 60K miles. In the cold weather it was difficult shifting from neutral to first and first to second gears when cold. Shifting improved when the temperature increased after driving several miles. Therefore, I cannot recommend this lubricant for the stated application. Has always served me well in all my vehicles, whether its the engine, (gas and diesel) Transmission, or differential. I have lived in Florida and in Minnesota and have always had the flow needed to keep things lubed. I bought this lubricant specifically for my 1962 Ford Galaxie to replace the O.E. 90 weight that was installed in 1962. I've used Amsoil products since 2005 and will never go back to conventional lubricant. Its been good to me all these years and my classic car likes Amsoil too. It has made a big difference for my classic. I do a lot of towing with my vechile, from pulling large wagons such as gravity wagons and livestock trailers. I live in colder climates and never have trouble with my engine turning over hard. I started using this back in 2008 after speaking to a rep and someone who used the product he sold. I researched all of the findings and found the product to be superior to others. I used it his gear oil for my older 4 door Suzuki sidekick. And can really tell how great it works, quieter running gears, cooler temps. And last a very long time between changes. Completly serviced my 2015 GMC Sierria Denali 4x4 and I can tell the difference! Transfer case is smoother! Engine quiter! Gives you a feeling of confidence you can do what the truck is built to do! I use in my Jeep Wrangler, rear differential! Excellent product. The only fluids I use on my car and trucks. Setup gears and lockers for off road use. Always recommend or install Amsoil gear lube after my work is done. Feel very confident in a successful job especially when using this lube. This really do last a long time and no issues with over 50,000 miles since changing my rear differential and transfer case and the fluid is still clean. Put this in my 2wd Tacoma open differential, 10,000 miles so far and no issues. I purchased the premium AMSOIL synthetic product for its superior quality and long service life... will last longer and protect my vehicle better than conventional, so in the long run it's definitely worth the added cost. I'm 60 years old and have used every possible lubrication known to man, Mail is by far the best.